Watercolor and oil pastel resists create beautiful, interesting works of art. 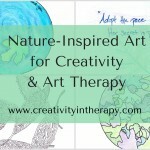 They are also a great activity for process-oriented art therapy. 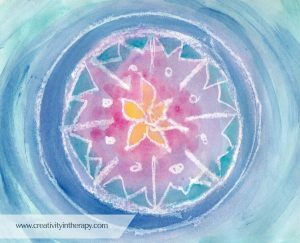 Therapeutic art can work on a lot of levels, such as a soothing activity for an anxious client, as a means of communicating something that is hard to find the words for, or as an experience that can reveal things about ourselves or help us practice a new way of being. 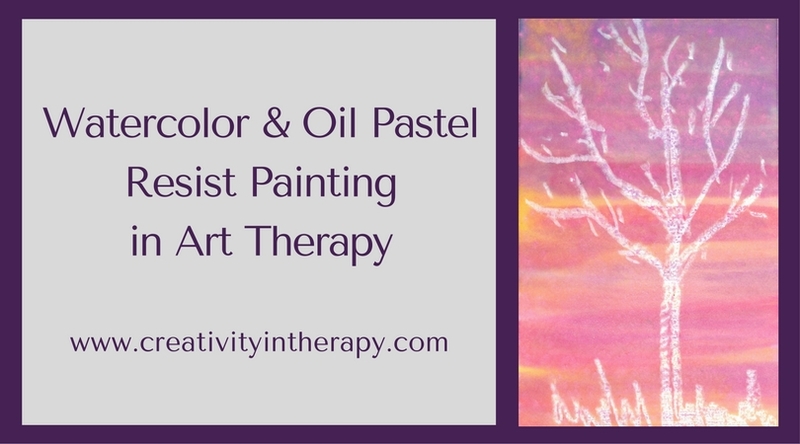 Process-oriented art therapy directives focuses more on the creative process and what comes up for the client in the experience, with less focus on the final product. 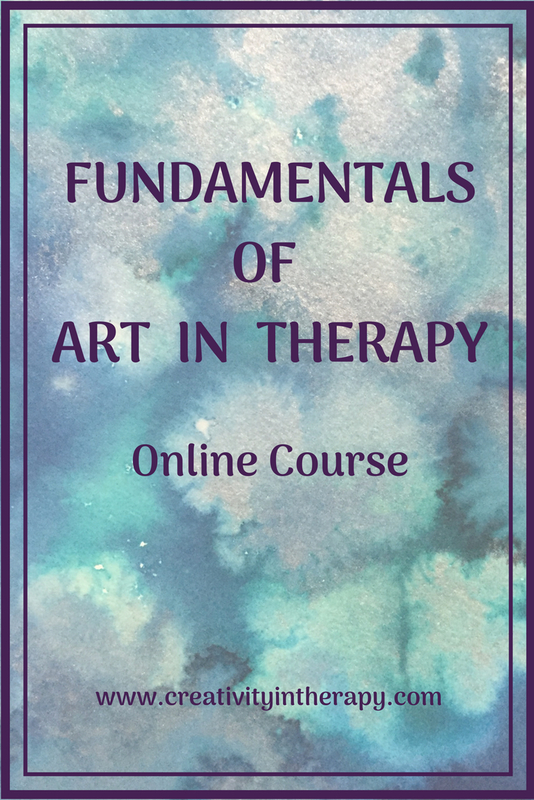 Of course, art does not need to be one or the other, and an art therapist will often explore both aspects of art-making, the process and the product with the client. This weekend I’ve been playing around with watercolor resist paintings, which is an art activity that can lend itself to either process or product focus in art. I found the activity both frustrating and enjoyable at different times, but definitely plan to do it more often. Clients often enjoy this activity, but it’s not something that I’ve done a lot on my own before. 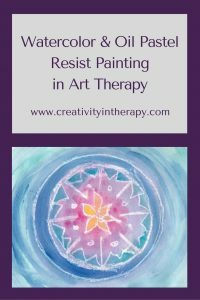 When clients are uncomfortable doing art or unsure of their abilities, like often comes up in groups in an inpatient setting, this activity seems to work well. One reason that people seem to enjoy the resist painting is that if they want to make a beautiful work of art, it’s very achievable. The bright colors of the watercolor pop against the bright white lines with a very satisfying result, even if your original drawing seems simple. 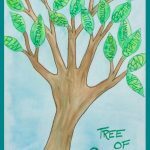 One of the therapeutic benefits of art-making like this can be the resulting feeling of mastery and enjoyment. 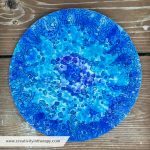 For clients that want to use this art process to express something, that is an option as well with the resist technique. For example, you can write an intention word that you want to focus on (as in my last blog post and one of my examples below), draw a self-symbol, or draw in a way that expresses your current emotions. 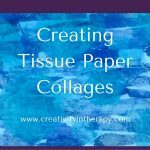 Another great aspect of this techniques, as I’ve mentioned, is that the creative process lends itself to some interesting questions to be discussed. I’ll share more below about ideas for exploring the artistic process and the experience. * Contains affiliate links. Your purchases help the blog continue. Tape down the paper. Use a white oil pastel or crayon to draw and/or write on the paper. Since it’s white on white, it will be hard to see what you are doing, so part of the experience will be to trust the process and accept the imperfections and lack of control. Brush over the paper with the watercolors; intense color will make the white lines pop off the page more. Use a smaller brush if you want to fill in small sections individually. If you have time for yourself or time with clients in session, you might encourage some experimentation first so that they get comfortable with the technique. As I mentioned above, I did have some frustrations with my materials not giving the desired effect at first. If you plan to try this with clients, be sure to try it out on your own first to make sure that your art supplies work as needed. When I used watercolor paper, the oil pastels did not have the effect of resisting the paint well and were mostly covered up by the paint. A very smooth surfaced sketchbook paper worked best. I also think that the opaque watercolors that I typically use were not great for this since they also have more ability to cover up the lines. Making my own liquid watercolors with food color and water actually gave me the best result, and I saw some suggestions on other blogs to try liquid watercolors for this activity. I have also seen clients have good results with simple, cheap watercolors in a tray. Keep in mind that pressing firmly with the oil pastel or crayon will give you a more substantial line and do better at resisting the paint. 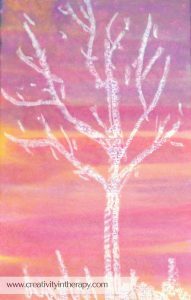 I also sprinkled some salt on a couple of my paintings as they dried, creating a more interesting texture in the colors (it shows up best toward the top of my example tree painting). If you try this, leave the salt until fully dry and then brush off with a rag or dry sponge. Different sized salt grains will give you difference effects; mine was table salt. 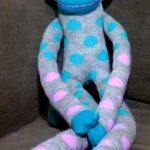 Here are some questions to think about and themes that I have seen come up in exploring the experience of this technique. Getting started – What’s it like to start with the blank page? For some people, there is a lot of anxiety that comes up in deciding what to draw or how to start. For others, there is a sense of possibility and playfulness. Intuition and trusting yourself – How does it feel to draw in white on a white page? Themes that often come up around this seem to be perfectionism, frustration, acceptance, and trust. 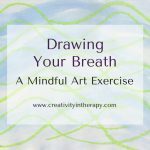 This activity can be great way to practice letting go of some of the perfectionism. You (or your clients) can try to focus on accepting whatever happens on the page, letting go of expectations, and trusting yourself as you work. This can also act as a metaphor for the actions that we sometimes need to take in our life even when we can’t see immediate effects; sometimes we need to do something and trust that it will lead to the result we want. 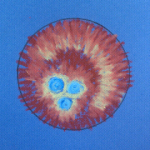 Accepting mistakes – Both oil pastels and watercolors do not lend themselves to erasing. Again, the process requires being able to let go of perfectionism and accept what happens. Can you find a way to be ok with the mistake and incorporate it into the final product? Sometimes the watercolor resist doesn’t seem to work well, like if the lines are too thin, and there can be discussion about the feelings that come up when something doesn’t turn out as you want. Did you still enjoy the process? Will you throw it away, try to turn it into something else, or try again on another page? 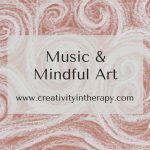 Playfulness and creativity – Art therapists will often remind clients that the most important aspect of art therapy is the creative process, not the final product. 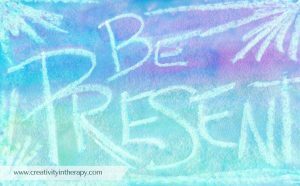 I encourage clients to approach this activity with a sense of playfulness and to appreciate the aspect of letting themselves do something different for just a small part of their day. Some people really enjoy the chance to play with art materials for the first times in many years; more experienced artists may appreciate the opportunity to just play around or try something new. Emergence and possibility – What thoughts or feelings come up as you paint and the design of the white lines begins to emerge? Are there possibilities within you or in your life that you want to discover or make more visible? How does it feel when what emerges as reality is not what you had expected or hoped for? Thank you for posting! I am going to try this exercise with a group of senior citizens today. We will use multicolor crayons and the cheap watercolors in a tray and, for a subject, I’ll try multi-layered flowers. I’m going to bring a lot of paper so they can “practice” a lot, as this seems like it won’t take much time. 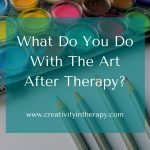 I especially appreciate you including the art therapy-related questions at the end of the blog post. Great post!! Hi Misa – thanks for reading the blog and glad you found this idea helpful! I’d love to hear how it goes. Multi-layered flowers should be a beautiful activity.